Here for the launch of A+E Networks’ LIFETIME Asia new six-part, digital-first original production, Who Runs The World With Mong Chin that will be aired on 23rd July 2018. Hosted by popular Singaporean social media influencer, Yeoh Mong Chin, the highly-anticipated series takes her on an epic adventure – six runs in six Southeast Asian countries over eight weeks: Singapore, Malaysia, Indonesia, Thailand, Philippines and Vietnam. The series marks the latest partnership between A+E Networks’ LIFETIME Asia and Canon. Making her debut on the small screen as the star of the series, Mong Chin, also known by her social media moniker ‘Mongabong’, is no stranger to being in the limelight. As part of her adventures across Southeast Asia, Mong Chin explores unique locations that are off-the-beaten-track. While prepping for her runs, she also meets individuals from all walks of life who are united by their love for running, music, food, fashion and more. 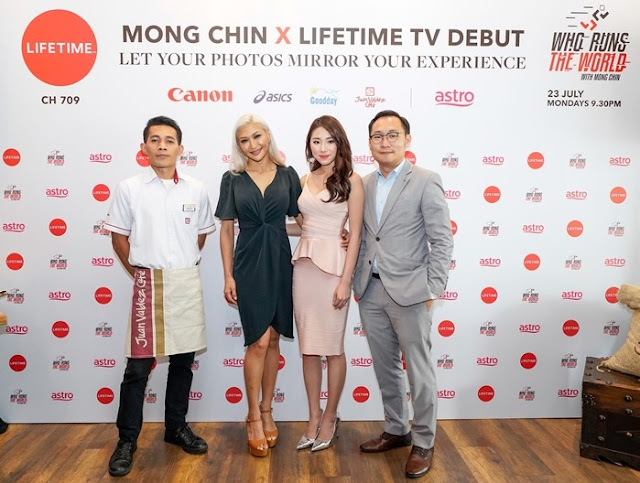 In Who Runs The World With Mong Chin, LIFETIME Asia will be embracing a digital-first approach where Mong Chin’s followers and LIFETIME Asia viewers get to follow her on her journey with exclusive online content filmed on-location. Viewers can connect with Mong Chin on a personal level, as they peel back the curtain to see what goes on in the life of an influencer. This is also in line with LIFETIME Asia’s mission to encourage and cultivate women’s talent and advocate for more women in influential content making roles in the media landscape. In her home country, Mong Chin takes on the ILLUMI Run, an ultimate party on the run where participants run through ILLUMI glow water and experience electrifying music in the ILLUMI dance zones. She also joins outdoor enthusiasts, Ministry of Adventure for a kayaking expedition at Punggol Waterway. Mong Chin then goes behind-the-scenes of Toruk: The First Flight by Cirque du Soleil, where she tries her hand at performing some moves with cast members including kite-flying and boomerang-throwing. Not to be missed is the ‘instagrammable’ Boufe Café, where Mong Chin tastes and snaps the most colourful sweet treats. The city’s most iconic running event – Standard Chartered Kuala Lumpur Marathon – sees Mong Chin join runners from all over the country, who pit themselves against international champions on the streets of Kuala Lumpur. To get in shape before the run, she meets personal trainer and businesswoman, Nana Al Haleq for a training session. While in Kuala Lumpur, Mong Chin visits batik artist Lazim Ismail and Nadia Hasbi, to design hand painted batik sports leggings. For a grand cafe experience, Mong makes a trip to Juan Valdez for their rich cup profiles, where she also has a go at making latte art. Mong Chin takes part in the annual Singha Songkran Chiang Mai Run – a race to celebrate the Thai New Year. This nighttime run ties in with four days of celebrations across Chiang Mai. As part of the festivities, Mong Chin joins the locals and tourists as they get soaked in water fights all along Chiang Mai Old City. Viewers will also see her walk through the Bua Ton’s Sticky Waterfalls. The rushing waterfall is not only a sight to behold but it has a unique feature that allows one to climb directly up the rocks into the oncoming cascading water. Mong Chin get the chance to feed and pet sheep at Farmyard Café, and then enjoy a refreshing ice-cold dessert – mango bingsu! In Hanoi, Mong Chin joins a local running club, the Hash Hound Harriers, on their run along the countryside. Following a trail set by ‘Hares’, the runners race to a mystery end location where a crate of beer awaits them! Mong Chin also helps the Hares set the trail for this race. While in Hanoi, Mong Chin soaks in the sights via a street tour on a Vespa, visiting the Unicorn Pub for a Pho Cocktail and wraps up at the famous Train Street along Hanoi’s Old Quarter. She is invited to dine at a local’s home and have a taste of authentic Hanoian cuisine. To conclude the trip, Mong Chin takes part in a 1920s themed murder mystery party and has to figure out who the murderer is by the end of the night! On the day of the famous Rinjani 100 ultramarathon, Mong Chin visits the second highest volcano in Indonesia, Mount Rinjani and does the beginners run up Bukit Sisek. In Lombok, Mong Chin also meets Chelsea Etienne, owner of Island Mermaids, the first school in the world to do mermaid swimming out in the open ocean! Mong Chin becomes a mermaid for a day and takes a glass bottom boat out in the clear sea for a swimming lesson at Pantai Pandanan. She visits the local Tanjung market to shop for local produce, then uses the ingredients to whip up a delicious meal in a traditional Indonesian cookery class. Continuing her adventure in Philippines, Mong Chin takes on the Spartan Sprint as part of the Spartan Race Cebu 2018. She faces multiple obstacles having to climb, push, jump, and crawl through fire, mud and barbed wire in order to finish the race. To wind down, she goes to Cebu’s famous BBQ street, Larsian Sa Fuente, the ultimate go-to place for Cebuano foodies to check out the best grill eateries in town.